The numbers were staggering! Some time ago at a camp for Christian young people, a short, three-question quiz was given to the teenagers in attendance—most of whom were from homes with Christian parents (and many of whom already had made the decision to become a Christian themselves). The first question asked simply, “How long ago did the dinosaurs live?,” and provided four possible answers. Over 70% of those present answered that dinosaurs had walked this Earth millions of years ago. People enamored with the type of material normally found within the pages of Time magazine, or National Geographic, or those who watch CNN and the Discovery channel, probably would not find that answer alarming. But try to harmonize the idea that dinosaurs existed millions of years ago—long before man is supposed to have arrived—with the Genesis account of creation. It simply cannot be done. These youngsters were not atheists or agnostics from some “intellectually elite” university; they were our children—children who have been reared and nurtured in the church, and who believe Jesus Christ is the divine Son of God Who lived and died for them. And yet, by the time many had reached their teens, they already had discounted the words of the Bible in favor of an evolutionary timeline that, from their vantage point at least, is dominated by the most amazing creatures ever to have lived—the dinosaurs. Ask an average 10-year-old boy or girl when the dinosaurs existed, and see what response you get. Follow up that question with one about whether or not men lived with the dinosaurs, and watch how quickly that same 10-year-old’s brow wrinkles in quizzical shock at the very idea of such. Chances are, that excited little face—which belongs to a child who could share a veritable plethora of dinosaur trivia with you—will change into a puzzled look that is accompanied by a troubling frown. For, you see, we live in a world where our children are taught that dinosaurs evolved, and became extinct, millions and millions of years ago—long before man arrived on the scene. And so, those precious little souls march off to school, where they will learn about the “terribly great lizards”—completely unaware of the fact that what they are learning is thoroughly at odds with the biblical account of creation. One thing on which both creationists and evolutionists agree is that dinosaurs make marvelous teaching tools. Rare is the adult—and even more rare is the child—who does not have a keen interest in dinosaurs. These magnificent beasts with the polysyllabic names capture our attention as we fixate on their massive size, their lizard-like skin, or the terror they apparently were able to create as they roamed the planet. From kindergarten through graduate school, dinosaurs frequently are used as a tool to indoctrinate students regarding the “fact” of organic evolution. In most public school, college, and university settings, whenever dinosaurs are discussed, it is in the context of their evolutionary origin, development, and extinction. Additionally, students are told about how the dinosaurs evolved into what we now know as birds. What effect does this kind of teaching have on young minds? If the correspondence we receive at Apologetics Press on a regular basis via telephone calls, e-mail, and regular mail is any indication, the evolution-based teaching regarding dinosaurs may be pulling more of our children away from the church than any other single concept. Because practically all youngsters have a fascination with dinosaurs, and because teachers are among the most trusted of all adults, children often accept without question evolutionary dogma and its accompanying concept of an ancient Earth. With what results? If testimony from many of the evolutionists themselves is taken at face value, the study of dinosaurs was the deciding factor in their conclusion to abandon their belief in God and to accept in its place organic evolution. Evolutionists like the late paleontologist Stephen Jay Gould of Harvard, the famed dinosaur hunter, Robert Bakker, and others are on record as stating that it was the study of dinosaurs, at a very young age, which set them on their lifelong path as evolutionists. Dr. Bakker even commented on this fact in the preface to his immensely popular book on dinosaurs (1986, p. 9). Edward O. Wilson, the father of the discipline known as sociobiology, once commented that when he was fifteen years old, he had “great fervor and interest in the fundamentalist religion; I left at seventeen when I got to the University of Alabama and heard about evolutionary theory” (1982, p. 40). Henry M. Morris, former professor and department head at Virginia Polytechnic Institute, observed that he “spent over twenty-eight years teaching in secular universities and saw this sad tale repeated in many lives” (1984, p. 113). Because dinosaurs are fascinating to children, because they are such an effective teaching aid, and because they generally are used to teach evolution, these creatures represent a formidable tool to be used in robbing students of all ages of their faith in God and His Word. This makes the controversy over dinosaurs most important. One of the worst mistakes we can make as parents, grandparents, and teachers is to suggest that dinosaurs never existed. While such a response may appear, at first glance, to be a simple and quick solution to “the dinosaur dilemma,” in reality, it is a response that becomes impossible to defend when our children visit a museum and come face to face with a two-story-tall Tyrannosaurus rex skeleton. Children cannot be expected to deny such tangible, forceful evidence, and at the same time believe a well-meaning but very wrong parent. Did dinosaurs really exist? Most certainly! We have discovered their fossilized remains on all seven continents—from North America to the Antarctic. As a matter of fact, great dinosaur graveyards have been discovered in places like Tanzania, Africa, and at the Dinosaur National Monument on the Colorado/Utah border in the United States. Literally tons of fossilized dinosaur bones have been recovered from all over the globe. In 1993, Mike Hammer even unearthed a fossilized dinosaur (from the Hell Creek formation in northwestern South Dakota) that was said to still possess the ancient creature’s heart. Plus, of course, paleontologists have unearthed numerous caches of fossilized dinosaur eggs. Soon, American fossil hunters joined in the search. The climax came in March of 1877, when two schoolmasters—Arthur Lakes and O.W. Lucas—separately stumbled onto colossal fossil bones projecting from the rocks in different parts of the state of Colorado. Lakes showed his find to the well-known paleontologist, Othniel Marsh. Lucas showed his find to Marsh’s bitter rival, Edward Cope. Marsh and Cope became the most famous of all the “dinosaur hunters.” All told, Cope named nine new genera of dinosaurs, while Marsh named nineteen. Now, no one who bothered to keep up with the times doubted the existence of the dinosaurs. The question no longer was, “did the dinosaurs exist?,” but “when did the dinosaurs exist?” Today, an important controversy exists between evolutionists and creationists regarding the matter of exactly when the dinosaurs lived. In fact, a chasm exists between these two groups that never will be bridged—so long as each side maintains its present view. Evolutionists advocate that dinosaurs evolved from some ancient reptile 200 million years ago, and that they became extinct roughly 65-70 million years ago. Man (in one form or another) allegedly evolved approximately 2-3 million years ago, and thus was separated from the dinosaurs by some 65 million years of geologic time. Creationists who accept Genesis 1-2 as an accurate, historical record of God’s creative activity, oppose such claims, and maintain instead that the dinosaurs were created by God within the six literal days described in the biblical record. Genesis informs us that all creatures were created during the Creation week (cf. also Exodus 20:11 and 31:17). Genesis also instructs us regarding the fact that dinosaurs, as land-dwelling animals, were formed on day six—the same day on which man was created. Thus, the inescapable conclusion is that dinosaurs and man would have lived together on the Earth as contemporaries. (1) If dinosaurs existed 200 million years before Adam and Eve it does not present any problem to a literal understanding of the Genesis record (1968b, p. 16). (2) I have no way of telling where man’s beginning should be on the chart [of geological time—BH/BT]. Clearly man has become the dominant form of life on the Earth only in modern times, but where Adam and Eve fitted into this picture is unclear (1968b, p. 35). (3) Birds, mammals and man are mentioned; and all of these are recent additions to the Earth geologically (1977, p. 151). (4) Man is a very recent newcomer to this planet (1968a, lesson 8). (5) Genesis 1:1 simply says, “In the beginning God created the Heaven and the Earth.” The verse is undated, untimed, and without details as to how this was done. Tradition has said that the first verse is an instantaneous event and that verses 2-31 detail how it was done. It does not seem to this writer that this interpretation is consistent with the flow of the language and the message.... Could not dinosaurs and many other forms have been involved in the production of an Earth ready for man? I further submit for your consideration that some time may be involved in this verse and that natural processes may have been used as well as miraculous ones to prepare the Earth for man (1982, pp. 5-6). The term “perceived” is from the Greek noeo, a word used for rational human intelligence. Paul, speaking by inspiration, stated that someone human was “perceiving.” What, exactly, were they perceiving? The things God had made. How long had they perceived those things? Since the creation of the world! Who, from a human vantage point, was doing the “perceiving”? Adam (1 Corinthians 15:45; Romans 5:14) and Eve (1 Timothy 2:13). The apostle’s point was that Adam and Eve had been present since the creation of the world (i.e., as a part of the six-day creative activity of God), perceiving the things that were made. And that includes the dinosaurs! The fact that some prehistoric man made a pictograph of a dinosaur on the walls of this canyon upsets completely all of our theories regarding the antiquity of man.... The fact that the animal is upright and balanced on its tail would seem to indicate that the prehistoric artist must have seen it alive (1925, pp. 5,7, emp. in orig.). Left: Edmontosaurus (courtesy of Paul S. Taylor, Eden Communications). Right: Petroglyph discovered by Dr. Samuel Hubbard in Havai Supai Canyon (courtesy of www.bible.ca). Nearby, Dr. Hubbard and his team of archaeologists discovered dinosaur tracks preserved in strata identified as Triassic—alleged by evolutionists to be more than 165 million years old. Question: How could Indians have known how to draw such a perfect picture of an animal (the dinosaur) that they never had seen (or had described to them by someone who had seen it)? Mammals evolved at the end of the Triassic, at the same time as dinosaurs, or just a tad later. Mammals spent their first hundred million years—two-thirds of their total history—as small creatures living in the nooks and crannies of a dinosaur’s world. Their sixty million years of success following the demise of the dinosaurs has been something of an afterthought (1989, p. 318). It thus is completely unthinkable, in evolutionary terms, that dinosaurs and advanced mammals (like elephants or giraffes) could have co-existed. Again, however, Dr. Hubbard’s discoveries have “thrown a monkey wrench” into the evolutionary timescale. During preparation of the specimen a patch of small bones was revealed within the ribcage, on the ventral sides of the posterior left thoracic ribs and vertebrae, where the stomach is positioned in extant mammals. Unduplicated dentition [teeth—BH], limb bones and phalanges [bones of the toes or “fingers”—] in the patch confirm that these bones belong to a juvenile individual of Psittacosaurus, an herbivorous dinosaur that is common in Jehol Biota. The serrated teeth in the patched skeleton are typical of juvenile Psittacosaurus. The skull and most of the skeleton of the juvenile Psittacosaurus are broken, disarticulated and displaced, in contrast to the preservation of the R. robustus skeleton, which is essentially in its original anatomical relation. Although fragmentary, the bones of the Psittacosaurus are packed in a restricted area. These conditions indicate that the juvenile skeleton of Psittacosaurus is the remaining stomach contents of the mammal (Hu, et al., 2005, 433:151). To complicate matters, researchers reported in the April 18, 2002 issue of Nature, one of the premier science journals in the world, that they now have determined that the “last common ancestor of extant primates” existed (as dated by evolutionary dating methods) 85 million years ago (Tavaré, et al., 2002). Since dinosaurs are supposed to have died out 65 million years ago, that means the primate would have lived with the dinosaurs for at least 20 million years. One of the co-authors of the Nature paper, Christophe Soligo of London’s Natural History Museum, stated in regard to the find: “What we demonstrate is that modern orders of mammals appeared well before dinosaurs disappeared...” (see “Primate Ancestor Lived with Dinos,” 2002). So much for the belief that mammals evolved “just a tad later” than the dinosaurs. Javier Cabrera Darquea came into possession of his first burial stone (from the Ica section of the country of Peru) when he was given one as a paperweight for his birthday. Ironically, he could recall his own father also possessing similar oddly carved stones that his family found in their fields in the 1930s. Dr. Darquea sought out the origin of his unique gift, in an effort to amass a collection of these unique stones, and eventually assembled over 11,000 of them. The rocks turned out to be ancient burial stones that the Inca Indians placed with their dead. Almost one-third of the stones depicted specific types of dinosaurs (such as Triceratops and Stegosaurus) and various pterosaurs. The type of art form represented by these stones, and their location, dated them to the time of the Inca Culture, c. A.D. 500-1500. How could these ancient Indians have known the anatomy of these creatures if they never had witnessed them firsthand? Validation of these stones comes from a full understanding of their history. In the 1570s, the Indian historian and chronicler of the Incas, Juan de Santa Cruz Llamgui, wrote about the engraved stones. He noted that Conquistadors had taken some of the stones back to Spain, and wrote that at the time of the Inca Pachachuti, many carved stones had been found in the kingdom of Chinca, in Chinchayunga. On October 3, 1993, the OJO, Lima Domingo, a major newspaper based in Lima, Peru, reported a Spanish priest traveling in the area of Ica in 1525, inquiring about the unusual stones that had strange animals carved on them. These reports verify that the stones were in existence long before those discovered by Dr. Darquea. Since that time, other investigators have had the opportunity to observe stones in Nasca tombs, as well as to inspect the entire Darquea collection. Recent discovery of fossilized sauropod (diplodocid) skin impressions reveals a significantly different appearance for these dinosaurs. The fossilized skin demonstrates that a median row of [dermal] spines was present.... Some are quite narrow, and others are broader and more conical (1992, 20:1068). The general skin pattern consists of round, non-overlapping, tubercle-like scales.... A rosette pattern of scales is present in PVPH-130 [designation for one of the specimens—BH/BT] (Chiappe, et al., 1998, 396:259). Again, we must ask: How could the Incas have drawn such accurate pictures of dinosaurs if they never had seen the animals (or had them described by someone who had seen them)? [For a discussion of Dr. Darquea’s research, see Swift, 1997]. 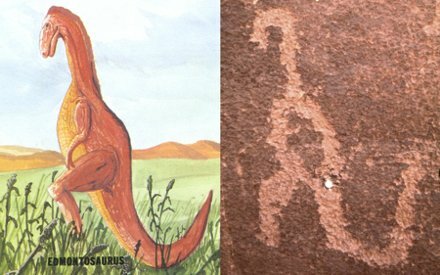 There is a petroglyph in Natural Bridges National Monument that bears a startling resemblance to a dinosaur, specifically a Brontosaurus, with long tail and neck, small head and all. In the San Rafael Swell, there is a pictograph that looks very much like a pterosaur, a Cretaceous flying reptile. The artists who created this “pterosaur,” and the “dinosaur,” could of course, have been trying to portray some other real or imagined creatures. 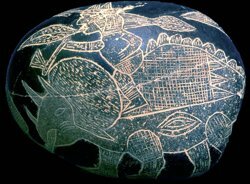 But what about other animals seen on rock art panels, such as “impalas,” “ostriches,” “mammoths” and others that either are long extinct in the western hemisphere or were never here at all? Such anomalous rock art figures can be explained away, but they still tend to cast doubt upon the admittedly flimsy relative-time age-dating schemes used by archaeologists (Barnes and Pendleton, 1979, pp. 201-202). If National Geographic is correct in stating that “no human being has ever seen a live dinosaur,” then whence came the models for these petroglyphs? On a bright and sunny morning in July 1944, Waldemar Julsrud, a German merchant in Acambaro, Mexico, found himself riding on horseback on the lower slope of El Toro (The Bull) Mountain. From his elevated vantage point, Mr. Julsrud spotted some partially exposed, hewn stones and a ceramic object half buried in the dirt. After climbing off his horse, he dug the stones (and a few ceramic pieces) out of the ground. Being somewhat archaeologically astute, Julsrud immediately realized that these artifacts were unlike anything that he had ever seen. The objects he held in his hand seemed distinctively different than those from other known Indian cultures. He eventually worked out a deal with a local farmer to excavate these precious pieces. When Teledynes Isotopes laboratories performed dating tests on the carbon deposited during firing on ceramic samples submitted by Hapgood, dates of up to 4530 B.C. obtained. Arthur M. Young, the inventor of the Bell Helicopter, who had sponsored Hapgood’s investigation along with [Erle Stanley] Gardner [author of the Perry Mason mysteries—BH/BT], submitted Julsrud artifact samples [i.e., the Acambaro figurines—BH/BT] to the University of Pennsylvania for dating. Radiocarbon dating performed by Dr. Froelich Rainey in the laboratories of the University indicated that this culture may have been developed between 6,400 and 3,500 years ago. Additional tests using thermoluminescence method of dating pottery were performed. They produced dates of up to 4,500 B.P. (Before Present), or 2500 B.C., which upset the professional archaeologists and set off within the scientific and museum world a controversy over the accuracy of thermoluminescence dating. Retesting was done, and it was announced that because of anomalous factors in the clays it was impossible to determine an accurate date (Hapgood, p. 17). According to David Childress, who penned the foreword to Hapgood’s book, the most recent thermoluminescence testing done on Acambaro pottery fragments (taken by Bill Cote and John H. Tierney during the filming of the video, Jurassic Art, in the early 1990s) obtained results of 3,975±55 B.P. (Hapgood, p. 18). Consider also the fact that teeth from an extinct ice-age horse, the skeleton of a woolly mammoth, and a number of human skulls also were found at the same site as the ceramic artifacts. Hapgood noted: “I later took these teeth to Dr. George Gaylord Simpson, America’s leading paleontologist, at the Museum of Natural History. He identified them as the teeth of Equus conversidans owen, an extinct horse of the ice age” (p. 82). Thus, the collection had evidence of extinct animals, human skulls, and dinosaur carvings from the same culture of people. But how could this be? Adding to the mind-boggling aspects of this controversy is the fact that the Instituto Nacional de Antropologia e Historia through the late Director of Prehispanic Monuments, Dr. Eduardo Noguera, admitted “the apparent scientific legality with which these objects were found.” Despite evidence of their own eyes, however, officials declared that because of the objects’ “fantastic” nature, they had to have been a hoax! (no date). This archaeological “hoax” presents insoluble problems for evolutionists. As Childress put it, “Most ‘respectable’ archaeologists will walk around the Acambaro mystery as if it were a land mine. The very existence of the figurines threatens the ivory tower of the current paradigm of history” (as quoted in Hapgood, 2000, p. 20). Dinosaur Bones Only Thousands of Years Old? 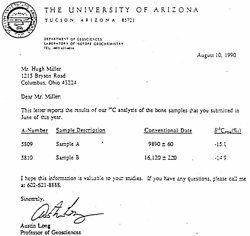 In 1990, samples of various dinosaur bones were submitted for Carbon-14 dating to the University of Arizona’s department of geosciences’ laboratory of isotope geochemistry. Bones from an Allosaurus and an Acrocanthosaurus were among those sent to the university’s testing facilities to undergo a “blind” dating procedure (which means that the technicians performing the tests did not know that the bones had come from dinosaurs). Not realizing that the samples were from dinosaurs prevented “evolutionary bias,” and helped ensure that the results were as accurate as possible (within the recognized assumptions and limits of the C-14 dating method). We have in our possession—on the official stationery of the University of Arizona—a copy of the test results for the Allosaurus bones (see reproduction at right, sample B). Amazingly, the oldest C-14 date assigned to those bones was a mere 16,120 years (and only 23,760 years for the Acrocanthosaurus fossils; see Dahmer, et al., 1990). Both dates are a far cry from the millions of years that evolutionists suggest should be assigned to dinosaur fossils. The February 26, 2000 issue of Science News contained an article that diligently attempted to defuse a potential bomb within the evolutionary camp (Hesman, 2000). Sitting inside the Boston Museum of Fine Arts is an ancient Greek vase. This vase is covered by a series of somewhat unusual paintings, including one that is bewildering to both archaeologists and evolutionists. The vase portrays a monster that possesses the head of a dinosaur. And, to make matters worse, the images on the vase depict men and dinosaurs as coexisting. Known as the Hesione vase, this elegant potteryware was created around 550 B.C., and depicts the Greek hero Heracles rescuing Hesione from the monster of Troy. The tale of the monster was first told by Homer in the eighth century B.C. In this legend, a terrifying monster suddenly appeared on the Trojan coast after a flood, and began preying on the farmers in the neighborhood of Sigeum. The king’s daughter, Hesione, was sent to be offered as a sacrifice to the monster, but according to the legend, Heracles arrived in time to kill it. The painting on the vase shows Hesione and Heracles battling the monster, with Hesione tossing rocks at it, and Heracles shooting arrows. You can understand the obvious plight of evolutionists when confronted with such imagery. Thus, in an effort to “explain” this artwork in light of evolutionary timescales, the editors of Science News concluded that the paintings on this unusual vase simply prove that ancient people dug fossils, too. They believe that this painting was the end result of fossils—possibly of an extinct giraffe—that were dug up thousands of years ago. What’s that old saying? If it looks like a duck, walks like a duck, and quacks like a duck, it’s probably a—giraffe? Human Footprints with Dinosaur Tracks? This spring, an expedition from the Institute of Geology of the Turkmen SSR Academy of Sciences found over 1,500 tracks left by dinosaurs in the mountains in the southeast of the Republic [Turkmen Republic—BH/BT]. Impressions resembling in shape a human footprint were discovered next to the tracks of prehistoric animals (see “Tracking Dinosaurs,” 1983, 24:10). Naturally, this report has received precious little attention, given the mindset of evolutionists. There is a place in Arabia...to which I went, on hearing of some winged serpents; and when I arrived there, I saw bones and spines of serpents, in such quantities as it would be impossible to describe. The form of the serpent is like that of a water-snake; but he has wings without feathers, and as like as possible to the wings of a bat (1850, pp. 75-76, emp. added). Herodotus knew of flying reptiles, and recognized that these creatures were neither birds, mammals, nor insects—but reptiles with wings. Notice also what the Jewish historian Josephus wrote 2,000 years ago about Moses and his army having a difficult time passing through a particular region because of the presence of flying serpents. [Moses] made baskets like unto arks, of sedge, and filled them with ibes [i.e., birds], and carried them along with them; which animal is the greatest enemy to serpents imaginable, for they fly from them when they come near them; and as they fly they are caught and devoured by them (n.d., 2:10:2, emp. added). 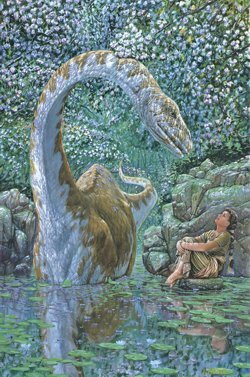 Although these two historians do not mention the extremely large flying reptiles, they do record that snake-like winged creatures, which could fly, did live in the distant past. These reports are consistent with findings that A.H. Verrill reported in 1954 in his book, Strange Prehistoric Animals and Their Stories. Primitive man, finding a fossil pterodactyl, might assume that the skeleton was that of some strange winged monster which still existed. Being totally ignorant of fossils and geology, an Indian or any other savage or semi-savage human being would never suspect that the bones had been reserved in rock for millions of years. Neither would it be possible for such primitive men to reconstruct mentally the creature as they appeared in life.... It is of course, inconceivable that the Cocle potter had first-hand knowledge of a living pterodactyl, ancient as the pottery is; yet had he been as familiar with the flying monsters as he was with pelicans and jaguars, he could not have depicted them more strikingly and accurately. Not only do the drawings show beak-like jaws armed with sharp teeth, but in addition the wings with two curved claws are depicted. Included also are the short, pointed tail, the reptilian head crest or appendages, and the strong hind feet with five-clawed toes on each (1954, pp. 55,57-58). Obviously, the scientific evidence for the coexistence of dinosaurs and man speaks loudly, and yet it continues to fall on deaf ears within the evolutionary community. That silence, however, does little to change the documented facts, as we now know them. Contrary to popular opinion, dinosaurs do not present a problem for creationists. In fact, quite the opposite is true. It is evolutionists who have a problem. While they continue to maintain, as the late paleontologist Roland T. Bird of the American Museum of Natural History once put it, that “no man had ever existed in the age of the reptiles” (1939, 43:257), the evidence documents exactly the opposite. The Mosaic record of the Creation is inexhaustively sublime. In it, we learn of the creation of the heavens and the Earth by an Almighty God. By divine fiat, light was formed and atmosphere was wrapped around this planet. Great seas were gathered together, and separated from dry land. The world of botany miraculously bloomed, and lights burst forth in the heavens. The waters swarmed with living creatures, and birds soared through the pristine air. Varieties of domestic animals and beasts were created and finally, man, the zenith of God’s creation, stood proudly upon the Earth’s bosom. The dinosaur—one of the most majestic of God’s creatures—stood with man. No doubt they pondered each other’s existence. Today, we still stand amazed at these awesome giants. And as we do, their presence in the past should remind us of the magnificence of the God Who was able to speak them into existence by “the word of His power” (Hebrews 1:3). Awesome creatures—from the hand of an awesome Creator. “Age of the Dinosaurs” (1993), National Geographic, 183:142, January. Bakker, Robert T. (1986), The Dinosaur Heresies (New York: William Morrow). Barnes F.A., and Michaelene Pendleton (1979), Canyon Country Prehistoric Indians: Their Cultures, Ruins, Artifacts and Rock Art (Salt Lake City, NV: Wasatch Publishers). Bird, Roland T. (1939), “Thunder in His Footsteps,” Natural History, 43:254-261, May. Chiappe, Luis M., Rodolfo Coria, et al. (1998), “Sauropod Dinosaur Embryos from the Late Cretaceous of Patagonia,” Nature, 396:258-261, November 19. Childress, David H. (no date), “In Search of Sea Monsters,” World Explorer, vol. 1 no. 7, [On-line], URL: http://www.wexclub.com/BackIssues/WEX7.html. Clayton, John N. (1968a), “The History of Man on Planet Earth,” Does God Exist? Correspondence Course, Lesson 8. Clayton, John N. (1968b), Teacher’s Manual, Does God Exist? Correspondence Course. Clayton, John N. (1977), “Dinosaurs and the Bible,” Evidences of God, Volume I (South Bend, IN: Privately published by the author), pp. 149-151. Dahmer, Lionel, D. Kouznetsov, et al. (1990), “Report on Chemical Analysis and Further Dating of Dinosaur Bones and Dinosaur Petroglyphs,” Proceedings of the Second International Conference on Creationism, ed. Robert E. Walsh and Christopher L. Brooks (Pittsburgh, PA: Creation Science Fellowship), pp. 371-374. Gould, Stephen Jay (1989), Wonderful Life: The Burgess Shale and the Nature of History (New York: W.W. Norton). Herodotus, (1850 reprint), Historiae, trans. Henry Clay (London: Henry G. Bohn). Hesman, T. (2000), “Vase Shows that Ancients Dug Fossils, Too,” Science News, 157:133, February 26. Hubbard, Samuel (1925), Discoveries Relating to Prehistoric Man by the Doheny Scientific Expedition (Oakland, CA: Oakland Museum of Natural History). Josephus, Flavius (no date), Antiquities of the Jews (Grand Rapids, MI: Baker, reprint). “Primate Ancestor Lived with Dinos” (2002), [On-line], URL: http://news.bbc.co.uk/hi/english/sci/tech/newsid_1935000/1935558.stm. Simpson, George Gaylord, C.S. Pittendrigh, and L.H. Tiffany (1957), Life: An Introduction to Biology (New York: Harcourt, Brace and Company). Swift, Dennis (1997), “Messages on Stone,” Creation Ex Nihilo, 19:20-23, March-May. 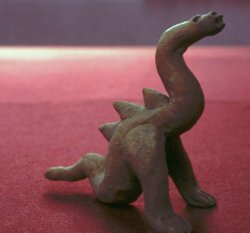 Swift, Dennis (no date), “The Dinosaurs of Acambaro,” [On-line], URL: http://www.omniology.com/3-Ceramic-Dinos.html. Tavaré, Simon, C.R. Marshall, et al. (2002), “Using the Fossil Record to Estimate the Age of the Last Common Ancestor of Extant Primates,” Nature, 416:726-729, April 18. “Tracking Dinosaurs” (1983), Moscow News, 24:10.